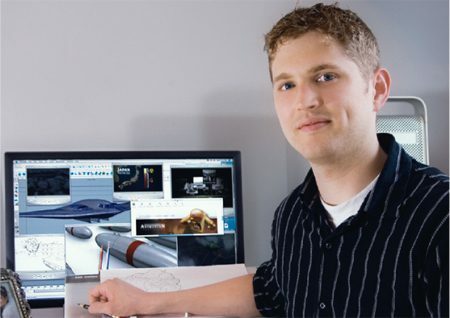 Eric Hochhalter, chair of the BYU Animation Alumni Association, is currently working on the documentary film Our Bombs. Hochhalter was one of the first students accepted into BYU’s accredited animation program, and he worked on the BYU short films Turtles and PetShop, both of which received “student Emmys” from the Academy of Television Arts & Sciences Foundation. He also helped create Der Ostwind, the first BYU student-produced film to play at the Sundance Film Festival. The chapter is unusual because it does everything online, says Shelli Thomas Sivert (BA ’99), alumni services coordinator. The BYU animators’ online community facilitates learning and networking for students and professionals alike through blogs and RSS feeds. To get involved with the BYU Animation Alumni Association, or to create your own affinity group, contact Shelli Sivert at shelli@byu.edu.